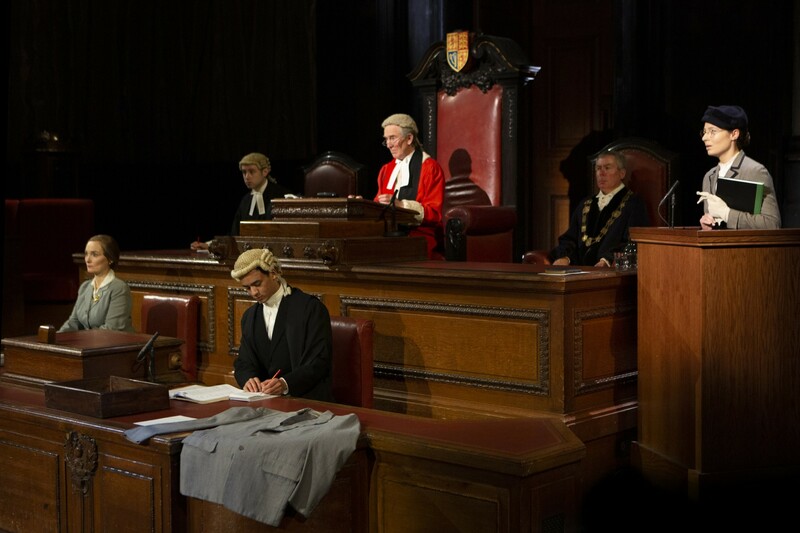 It was a stroke of marketing genius on the part of director Lucy Bailey and her producers to decide to stage one of Agatha Christie’s best loved court room dramas in something approaching a court room! 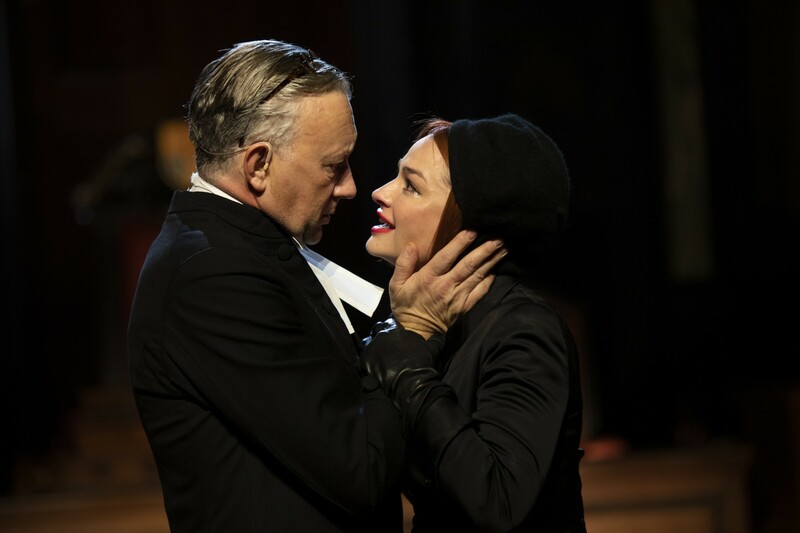 Setting Witness for the Prosecution within London’s abandoned County Hall becomes as much the grandest `immersive’ theatrical experience in London as much as a revival of an old stage thriller. The capital’s legislative home from 1922, shockingly Mrs Thatcher had it closed down in 1986 – a crime against local democracy that has gone unpunished to this day! The building’s external architecture more resembles something akin to the grandeur of Paris with its gilt and magnificent marbled and wood carved central chamber. Internally, walking into the main chamber, you can’t help but be impressed, so neatly has designer William Dudley turned the room with its coat of arms, giant marble pillars, soaring domed ceiling and steep public galleries into a close replica of the Old Bailey. Presided over currently by Christopher Ravenscroft’s benevolently commanding `Judge’ Justice Wainright, the scene is set for the murder trial of one Leonard Vole (Daniel Solbe). Before the judge, in a semi-circle, sits the audience and to Wainbright’s right, the jury made up of members of the audience who have paid for the privilege. For the rest of us, we are treated to what one reviewer has already described as `the comfiest theatre seats in London’. I’d certainly say amen to that. Wide, leather-bound, they’re made for long hours of contemplation although here, audiences will find the event lasts barely two hours. Did or did not young Leonard murder Miss French, the elderly, wealthy woman who befriended him, one night in October? I wouldn’t dream of saying more, now would I? Suffice to say that Witness, made into a memorable film with Charles Laughton as the defending QC and Marlene Dietrich as Vole’s German-born `wife’ follows a familiar Christie pattern of jealousy, betrayal, and greed before arriving at the climax which I’m happy to say I had forgotten. Bailey’s production is now into its second year and has just changed its cast. Emma Rigby makes Romaine Vole a slinky, heavily accented, somewhat stereotypical femme fatale but plays it for all its worth whilst Solbe on his stage debut also impresses as her deceptively sweet-faced husband/accused. 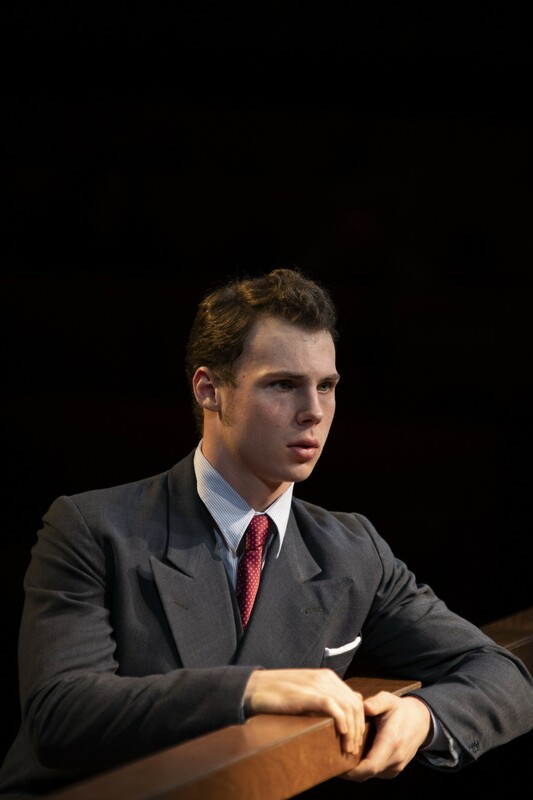 Jasper Britton meanwhile turns in a bravura performance as Sir Wilfrid, a QC who clearly flourishes in the theatrical atmosphere of the court. Indeed, the trial scenes, predictably perhaps, prove the high points of Bailey’s production – partly because they are the clearest to hear. Packed, on a bitterly cold January night, my only caveat would be, ironically for a chamber designed for debate and discussion, that the acoustics do not lend themselves well to intimate dialogue, so much of the early scenes are lost in the County Hall’s echoey expanses. However, as Christie does us the great favour of repeating information several times in different situations, little of importance is lost and most spectators can sit back and enjoy what turns out to be a highly polished account of Christie’s psychological and court drama. Certainly one for her many aficionados.